In “LA County Potted”, I actively took over the role of the conservator as I nursed a temporal map of the Los Angeles County. 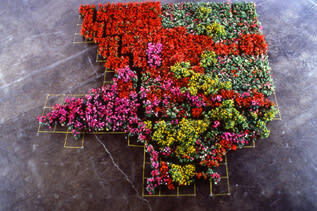 My map mimicked the ethnographical data through its use of potted flowers chosen based on their price, place of origin, form and characteristics such as hardy or tender, desirable versus weed. All of the plants had different needs, one group required full sun exposure, another was shade tolerant, yet others were indoor plants. By design, the conditions inside the gallery favored certain species while it doomed the survival of others. For the duration of the installation, I was on site to maintain this floral garden, trying my best to keep the flowers in their most perfect appearance. Equal care was given to all. For instance, individual pots were watered for 10 seconds each. Yet, despite this painstakingly careful equal treatment, certain flowers died within a few days while others thrived throughout the show. The installation was further enhanced by plug-in floral fragrances to intensify elements of artificiality, allure and concealment.